Researching a recent acquisition to my postal librariana collection I discovered the story of African American librarian Alma Smith Jacobs (1916-1997) of Montana. 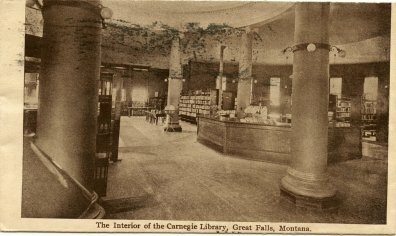 The postal artifact is an envelope (shown above) with an image of the interior of the Carnegie Library in Great Falls, MT covering the entire face of the envelope. 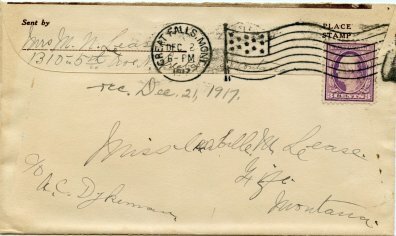 The back of the envelope which was mailed on December 2, 1917 has the address information. The Great Falls Public Library has an excellent history of the library on its website. It was there that I learned that after serving as a catalog librarian for eight years Alma Jacobs became head librarian in 1954, a post she held until 1973. She left Great Falls to become the Montana State Librarian in Helena where she ended her library career in 1981. She was the first African American to hold that post. While in Great Falls she led the effort which resulted in the replacement of the Carnegie Library with a new library building in 1967. The Women’s History Matters website has an excellent overview of Jacobs’ contributions to library and community service in Montana. In an unusual coincidence of timing I discovered that on April 28, 2017 the Great Falls Public Library dedicated a mural of Jacobs. The library had previously named the library plaza in her honor. Alma Jacobs was the first African American elected as President of the Montana Library Association, the first elected as President of the Pacific Northwest Library Association, and the first to serve on the Executive Board of the American Library Association. Jacobs’ sister Lucille Smith Thompson was also a prominent African American librarian (Little Known Black Librarian Facts Blog). The American Library Association’s Library War Service operated forty-one camp libraries in the U.S. during World War I. ALA produced postcards depicting most of the camp library buildings, and I have examples of almost all of those in my library postcard collection. 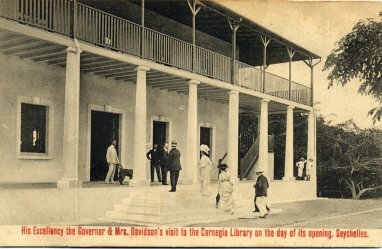 I particularly seek out those postcards with messages, and I’m always delighted when the message refers to the library depicted on the postcard. 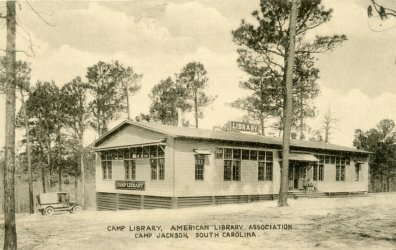 The postcard above depicts the library at Camp Jackson, SC. 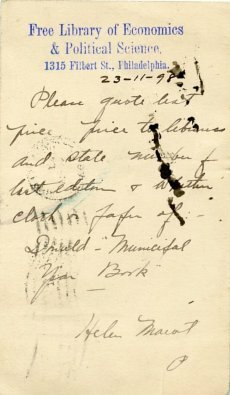 It was written on 11/10/18 but was postmarked on 11/11/18, Armistice Day. 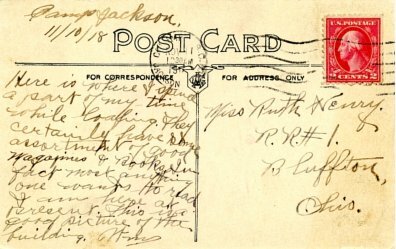 The postcard bears a 2 cent stamp. 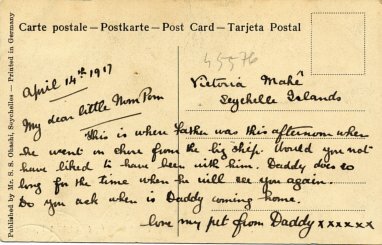 On Nov. 2, 1917, the postage rate for postal cards and postcards was increased to 2 cents to help pay for the war. The message is a testimonial for camp libraries. It reads: “Here is where I spend a part of my time while loafing. They certainly have an assortment of good magazines and books. In fact most anything one wants to read. I am here [the library] at present. This is a good picture of the building." 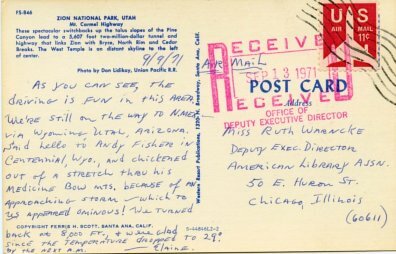 I have written another blog post about camp library postcards with messages. April 6 marks the centennial of the U.S. entry into World War I. Almost all history related organizations in the U.S. will do something to commemorate the U.S. participation in the war. 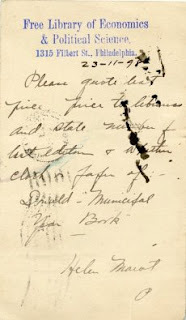 The involvement in the war by the American Library Association through its Library War Service has been a longtime interest of mine and I have written many posts on this blog about that involvement. I’m helping to commemorate the work of ALA’s Library War Service with two different exhibits this year. 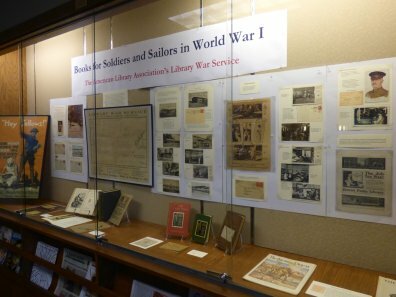 I have an exhibit at the Middleton (WI) Public Library this month which features some of the larger artifacts in my collection related to the Library War Service (see photo above). I hope to share this exhibit with other Wisconsin libraries also. My other exhibit (see photo below) is one that I have developed for stamp shows and includes postal items and other paper artifacts about the Library War Service. I have already shown the exhibit at two stamp shows and expect to show it in several more this year. The American Library Association Archives which has an outstanding collection of archival materials related to the Library War Service will be doing a number of things to commemorate ALA’s involvement in the war. The Archives has already posted several outstanding articles on its blog. 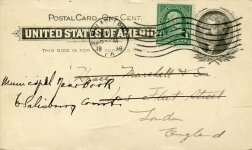 More general online exhibits about the U.S. involvement in World War I have been created by the Library of Congress and the Smithsonian National Postal Museum. Notwithstanding a not so great year nationally and internationally, it has been a good year for the promotion and celebration of library history. 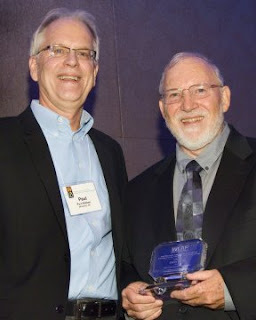 An obvious highlight for me personally was my induction into the Wisconsin Library Hall of Fame at the Wisconsin Library Association Conference in Milwaukee in October (see photo above). On the national scene it was a landmark year for the American Library Association which celebrated its 140th anniversary. Of particular note was the effort of the American Libraries magazine to call attention to this milestone. Several other major events also occurred in 1876, the founding year for ALA, and were less well noted on their 140th anniversary. They included the establishment of the Library Journal magazine; the publication of Melvil Dewey’s Decimal Classification System; the creation of the library supply company Library Bureau, also a Dewey effort; and the special report of the US Bureau of Education on the status of Public Libraries in the United States of America (in actuality all libraries in the US other than personal libraries). The Wisconsin Library Association celebrated its 125h anniversary. I was privileged to serve on the committee which was charged with planning the celebration. One of my contributions to this effort was adding content to the Wisconsin Library Heritage Center website about WLA’s history and events related to the anniversary celebration. I continued my efforts to collect and to exhibit postal artifacts related to libraries in 2016. 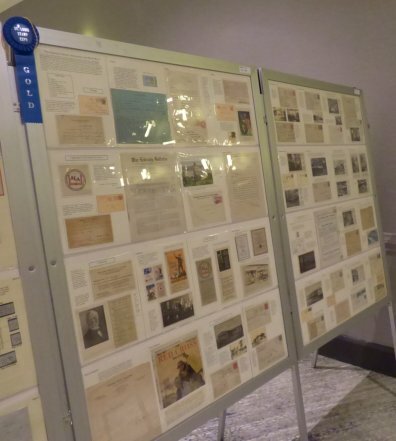 My major philatelic exhibit for the year was “America’s Library – The Library of Congress”. At national level stamp shows the exhibit received gold medals in St. Louis, Minneapolis, and Chicago. In St. Louis it was judged to be the “Best Display Exhibit”. The exhibit was also selected as the best exhibit at the Wisconsin state stamp show. It was wonderful to conclude the exhibit with a reference to the appointment of Dr. Carla Hayden as the Librarian of Congress. My collection of Wisconsin Library Memorabilia was on display at the Milwaukee Public Library and the Middleton Public Library this year. 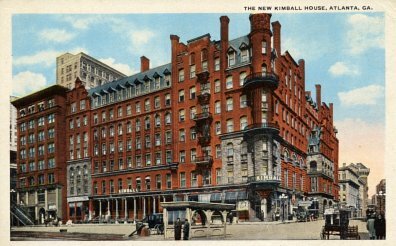 It was not a great year for writing new blog posts for the Library History Buff Blog. I only published 21 posts for the year, an all time yearly low for me. On the positive side all time page views for the blog exceeded 600,000. I hope to do much better in 2017. 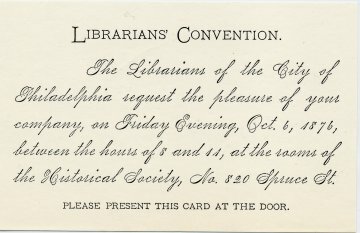 In the very limited world of library history blogging the ALA Archives Blog has set a high standard for quality posts. One hundred and forty years ago today the American Library Association was created in Philadelphia, PA. Below are some links to online exhibits that help celebrate this milestone in the history of ALA.
I’ve recently added a name badge for R. L. Walkley (Raymond L. Walkley) at the American Library Association conference in Saratoga Springs, NY in 1918 to my collection of librariana. The ALA conference ran from July 1 to July 6 and had 620 attendees. It’s nice to be able to tie a library artifact to a specific librarian. Walkley served as Assistant Librarian of the Minneapolis Public Library from 1914-1920. He took a leave from MPL to serve in ALA’s Library War Service in 1917-1918. 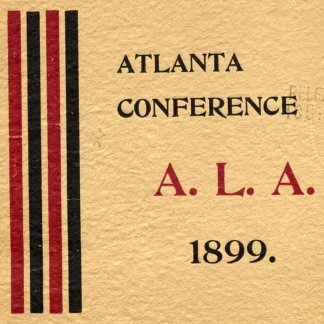 Obviously a major topic of discussion at the 1918 conference was the war effort of ALA. 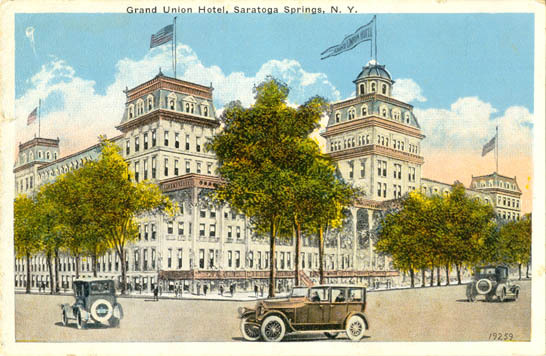 The 1918 conference hotel was the Grand Union Hotel in Saratoga Springs. Walkley later served as Librarian of Tufts College. 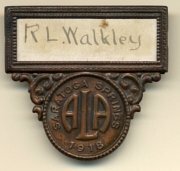 See some other early ALA conference name badges HERE.